Looking for a great scramble in Banff National Park? 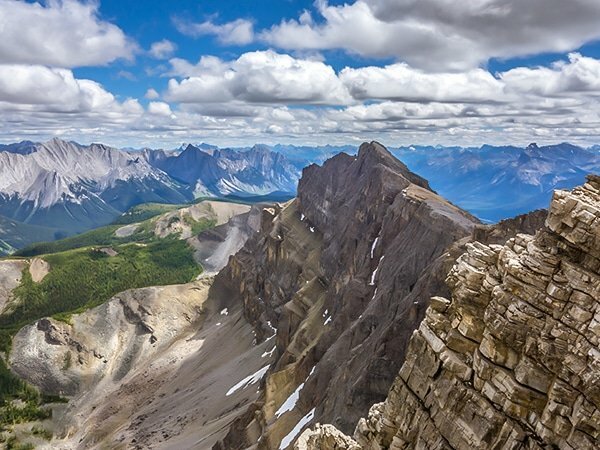 Banff National Park offers some of the most beautiful alpine scenery in the world, and the best place to look out is from the top of a mountain. With towering granite peaks, rushing rivers and streams, waterfalls and thick pine forests, this is the place for fantastic outdoor recreation. Beware that scrambling is different from hiking, and you should be experienced before trying one of these scrambles. The best scrambles in Banff require some skill and we recommend that you learn a few techniques before starting out. You will need to be comfortable with heights and able to use your hands as you move along a mountainside. The scrambling trails mentioned here range from easy to moderately challenging. 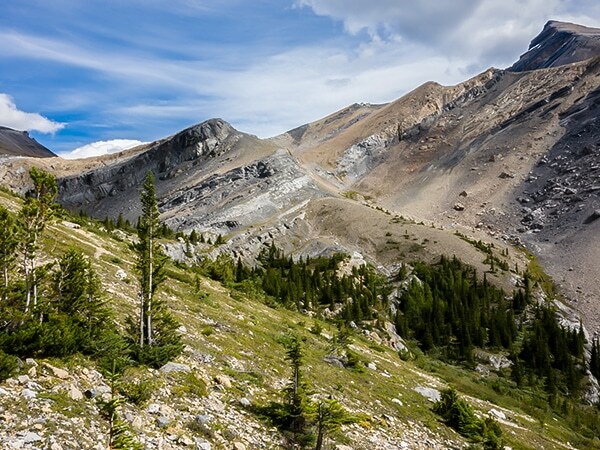 Here are 10 of the best scrambles in Banff. Whether you scramble to the summit of Mount Bourgeau or not, this is one of the best scrambles in Banff, and it’s not too hard. 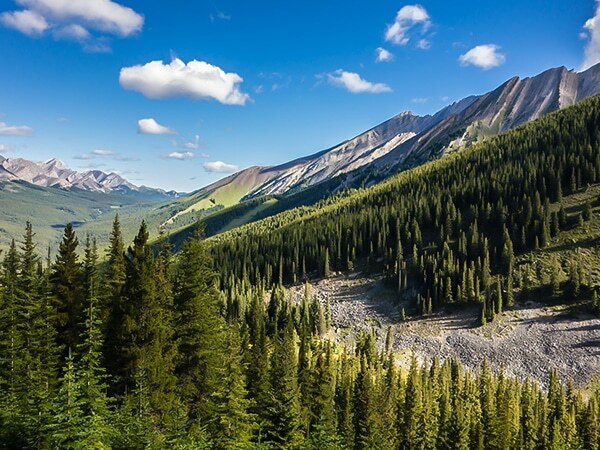 The scenery along the way is worth the effort with sweeping views of the Bow Valley, Bourgeau Lake and Harvey Pass. It is a long scramble and may not be the best for beginners. 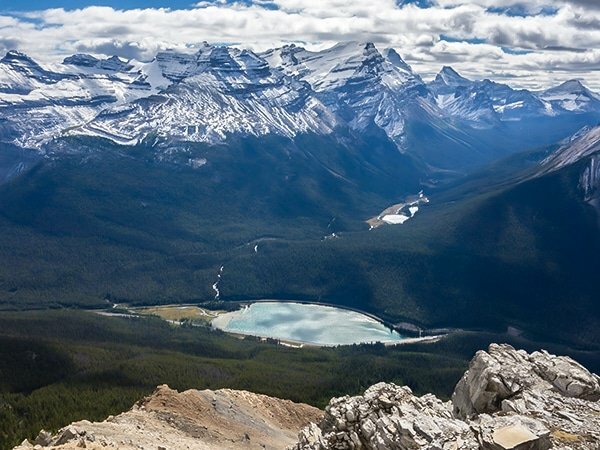 Get a spectacular view of the Continental Divide as well as the stunning Peyto Lake and Bow Lake from the Observation Peak scramble. Called Observation Peak because you are above the lakes and the glaciated giants that surround them, this great Banff Scramble is popular for a reason. This is another of the best scrambles in Banff National Park. The scramble is to the summit of Helena Ridge where you get a fantastic view of the Castle Mountain Plateau. You will see an amazing array of mountain scenery along the way, including pristine lakes, primeval forests and even fossils.  This is a shorter scramble that may be suitable for beginners. OK, it’s just outside of Banff National Park in BC, but it’s so good we need to share it. Paget Peak gives you a birds-eye view of the mighty peaks that form the Continental Divide. From this vantage point, Sherbrooke Lake looks like a gem set in silver. You will find a fire lookout along the way where you can rest, have a small picnic and even turn back if the beginners are getting tired. This is the most classic scramble in Banff, Cascade Mountain towers over the town of Banff. While a challenging scramble, experienced scramblers will love the views from the top of Cascade Mountain. You will see Bow Valley, Lake Minnewanka and Banff Town as well as the hundreds of peaks that surround the area. 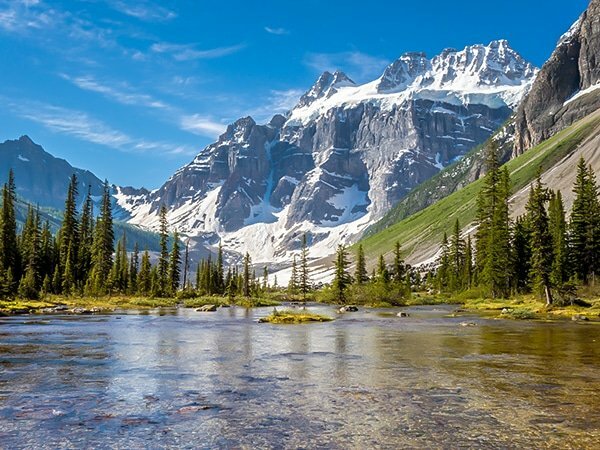 A classic Canadian Rockies scramble, this path has an easy walk through a fairy-tale forest and an exciting river crossing. The alpine pass you need to go through is in a secluded area but the vistas from the summit are worth the effort. 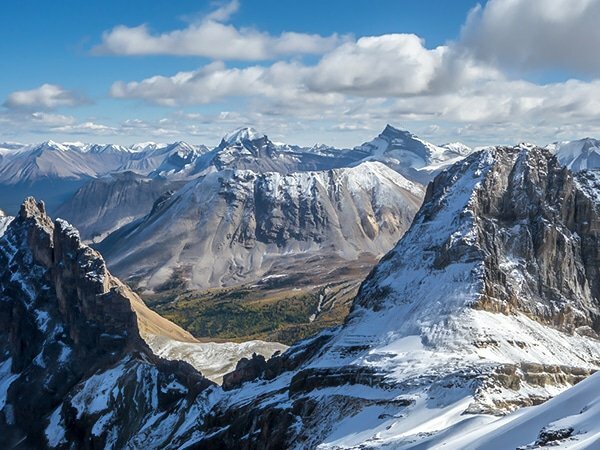 Bow Peak is one of the best scrambles in Banff National Park if you want to see amazing peaks and stunning ice fields. Get up-close-and-personal with the Hector glacier on this great scramble. In addition, the summit of Little Hector provides sweeping views of the surrounding peaks, several glacial lakes and ice fields. 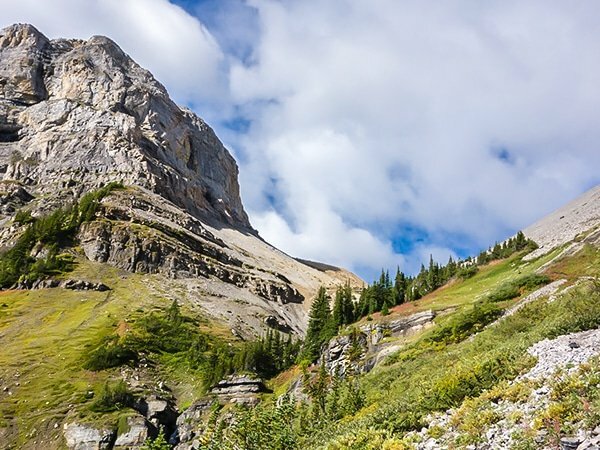 Mount Richardson is the highest mountain in the Skoki region, near Lake Louise. 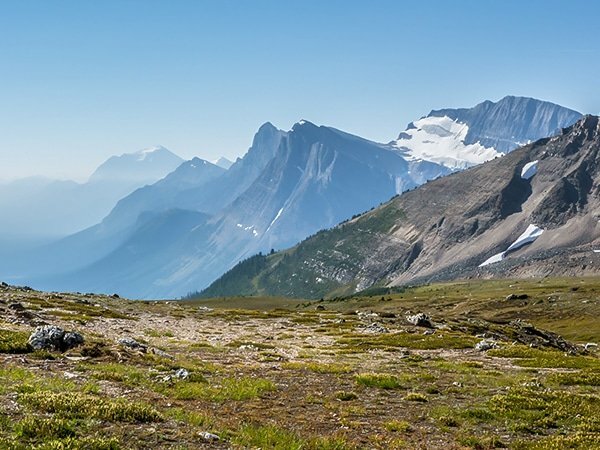 World famous for amazing alpine scenery, you should add this scramble to your must-do list if you’re in the area. If you go in late September, you get a colorful array of leaves including yellow larches. 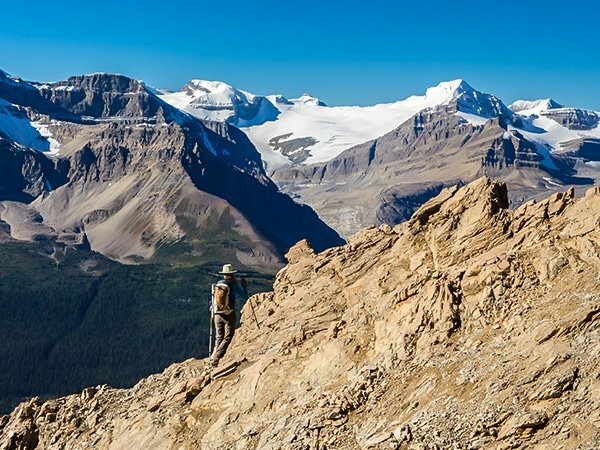 If you are looking for one of the best scrambles in Banff National Park for a variety of scenery, you can’t do better than The Onion. 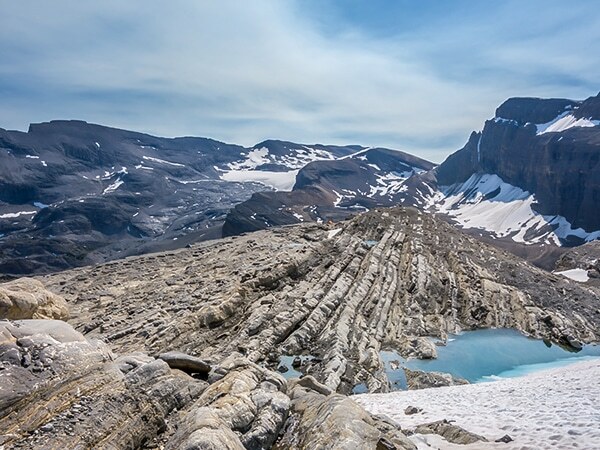 Located near Bow Hut, you will arrive at the base of the Wapta ice fields and see glaciers, tarns and amazing rock formations. Love the list, but I'm not sure that Bourgeau is really a scramble. Maybe to new scramblers, but if you're experienced it's more of a long hike. Still one of the best summits you can easily get to in Banff. Also, the Onion should definitely be higher, it's a lot of fun, though a bit of a long drive from Calgary.